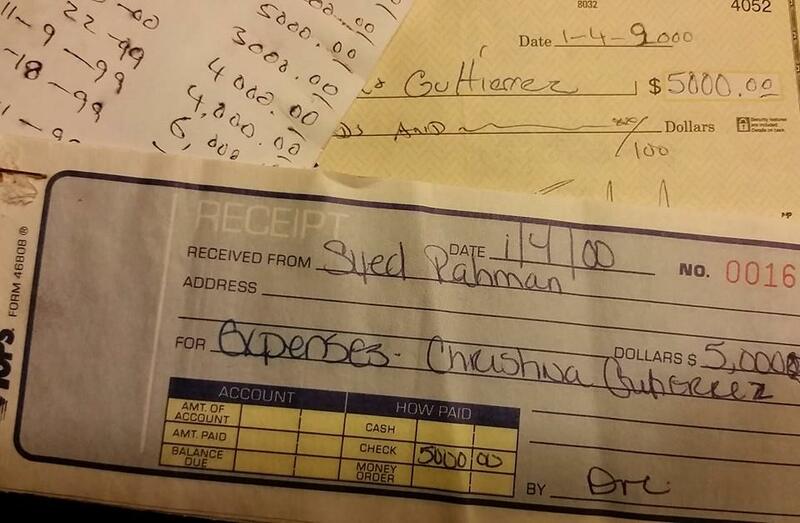 Checks issued by Adnan’s parents to CG that I’ve held for 15 years. Look closely at that total on the white note card. And that’s not even all of it. *Two major issues were address in this episode – religious bias and Christina Gutierrez. Because they both require a thorough treatment, I’ll address them in separate blog posts. This post will be about the issue that, for the first time in listening to the podcasts, really upset me. Sarah and I disagree about Christina Gutierrez. And I think she’s wrong. Really wrong . Let me first explain why I stand where I stand on Christina, and then explain why Sarah isn’t with me. I wasn’t able to attend the first trial – I was busy taking law school finals in December of 1999 in Virginia . But I heard about it, how it went down, how Christina asked for a mistrial, it was granted, and the jury was polled with positive results. It was over before my exams were. At this point I had never met Christina. I wasn’t part of the community decision making process, but I had heard she was a legal giant. I was relieved to hear it, but never got involved in the case beyond being in touch with Adnan and his family. Until the second trial. The first time I met Christina was on January 4, 2000 before the second trial began. Adnan’s parents were terrified of her, and asked me to come with them to ask questions about the case. I had heard about her and was pretty terrified myself. I was a law student who had never seen a criminal trial. This woman was allegedly a beast in the courtroom. But I thought it was the least I could do to help ask the questions Aunty and Uncle had (this is how we address elders in the community, regardless of whether you’re related) and assist with any legalese they may not understand. The meeting lasted roughly six minutes. 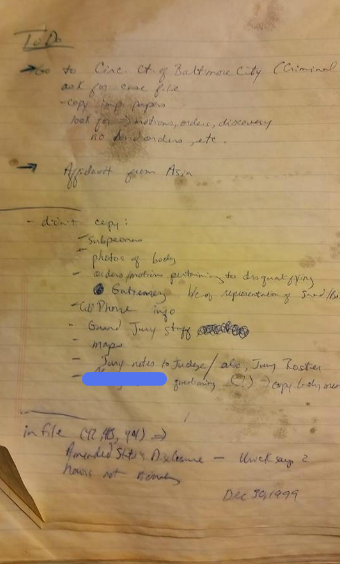 I had a list of questions and things to discuss prepared in a notebook, including the possibility of Adnan testifying, who the community she should connect with, media strategy, evidence in his defense. Aunty timidly introduced me – and I had barely opened my mouth when she shut me down. I tried to stammer that they were paying her fees and as parents had questions, but it got nowhere. She made it clear that she would not answer any questions, period. She would not discuss strategy with his parents, period. She would not discuss anything, period. Her focus for the following four minutes was money. How much they had to cough up, by when, and for what. She had already been paid a substantial retainer before the first trial, but needed more money. Specifically she asked for $5000 to bus the jury to the location that Hae’s body had been found. She needed the money immediately. $5000 check written to bus the jury to Leakin Park. Which never happened. 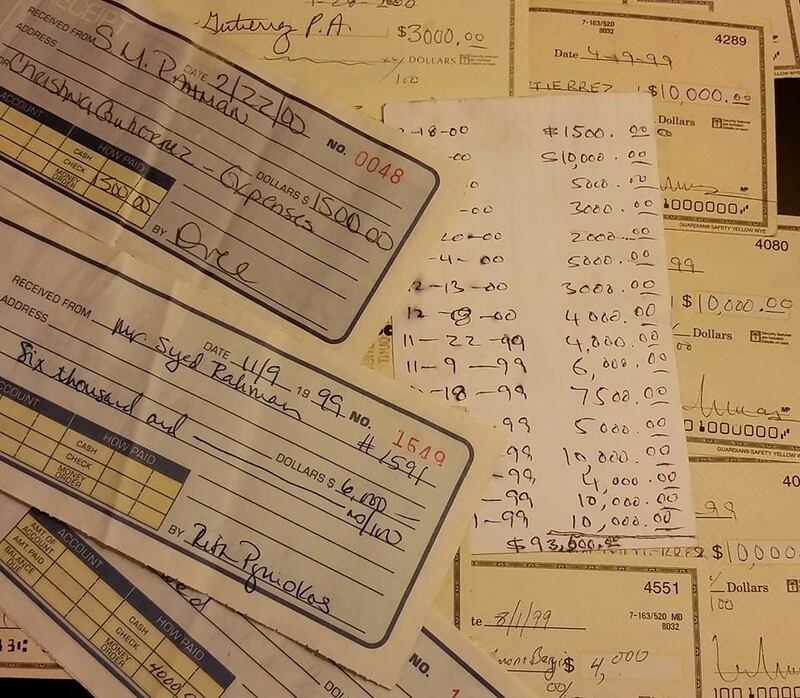 Uncle quietly pulled out his checkbook and wrote the check. Her job done, Christina left the room. Someone from her staff told us to wait as they got us the receipt. Then we left. I escorted Aunty a second time to meet her, and to be honest I have no recollection of that meeting other than not saying a word. I didn’t even want to make eye contact with her. I can’t remember what Aunty wanted to talk about. I do remember it was as short as the first meeting and another check was written. Suffice to say I did not like her – more accurately I was mortified by her. I wasn’t a lawyer yet, but you didn’t have to be one to know that this is not how you treat the parents of kid charged with first degree murder. Parents who are footing big fat bills, and are immigrants confused and scared of the system. Adnan’s family was never able to talk to Christina and get answers. She was intimidating and obtuse, not open to discussion of anything outside of money, ever. Now I totally understand attorney-client privilege. But where the client has given permission for his case to be discussed with family or other representatives, attorneys are free to discuss it. We have never had issues like this with subsequent attorneys. Justin Brown, Adnan’s excellent post-conviction attorney for the past five years, has walked Adnan’s family and I through every step of his work, answered questions, listened to our concerns. While there are some things an attorney may keep confidential, the attorney-client privilege is not a total bar to discussing a case when the client has given permission otherwise. The trial was hard, really painful to sit through. I was thoroughly confused. How was she a star attorney? From my bench in the courtroom her defense was a disaster. I remember thinking over and over “my God, a brand new graduate could do a better job”. I often could not follow Christina. 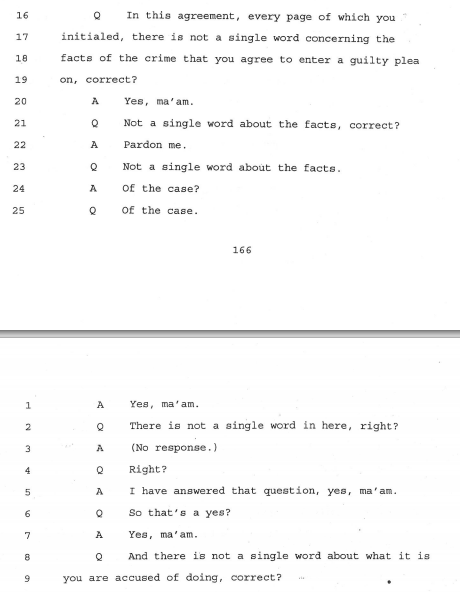 She rambled, repeated the same questions so many times the judge would ask her to move on already, missed tens of dozens of opportunities to nail a prosecution witness, not only failed to convey a cohesive narrative, but mostly failed to make any point at all by asking some of the strangest, most irrelevant questions. Christina’s examination of Yaser Ali. What is the point of these questions? Why is CG spending so much time on religion instead of making it irrelevant? God knows. Or as Jay would put it, all knowing is Allah. Jay would put it that way because Adnan never would. That is not a phrase we moozlums employ as a matter of course. There was a lot of this happening. Was he not? Do you not? Is it not? 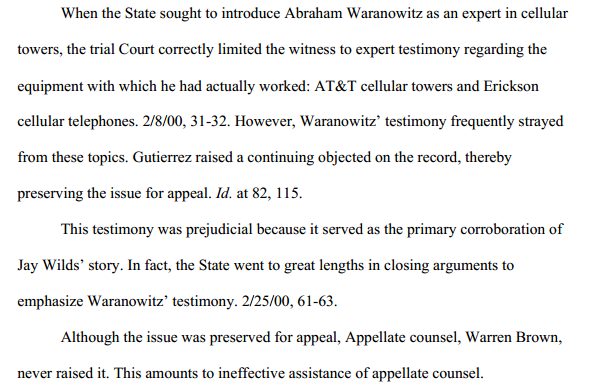 The only thing she nailed consistently (ironically probably adding to the irritation of the jury because of hundreds of objections) was preserving the record for appeal. Here is what that means: among other things, every time an attorney raises an objection or a motion, he/she is forcing the judge to make a legal ruling. Sustained, overruled, granted, denied. These are the legal issues that can then be raised on appeal – did the judge mess up any of those rulings? Christina was a master at it, and successfully preserved all the major issues for a future appeal. But as the trial went on, beyond what I felt was her poor presentation/bedside manner during direct and cross, two things became very clear: 1) money that was paid for specific reasons wasn’t used (such as the $5000 to bus the jury to Leakin Park) and 2) there was no defense prepared. 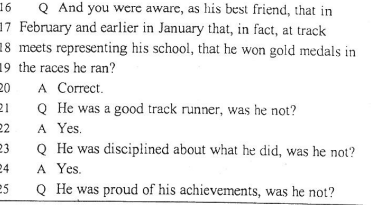 3) Find evidence like phone records for said payphone, get physical evidence tested for DNA, subpoena phone/pager records for Jay and Jen, pull Adnan’s emails, investigations on Jay and Jen, tracking down the women Jay was apparently “stepping out” on Stephanie with, etc. 5) Contact a slew of potential alibi witnesses. I mean, JUST CONTACT THEM. From the post-conviction appeal brief. Note the second sentence. Its important. Now, as awful as a job I thought she did, the first time I actually wondered if she threw the case deliberately was immediately after the conviction. The conviction was read, Adnan was taken away, we were all sobbing and heaving as expected and made our way out of the courtroom. I got into the elevator with Aunty and Yusuf, who must have been around ten years old at the time. Christina entered the elevator with us. We didn’t say a word, even at that point we were totally frightened by her. But Christina had one thing to say. “I’ll need $50,000 for the appeal”. No one responded, the elevator opened, she walked out, and that’s the first time I said out loud “you have to fire her”. *Aunty Shamim remembers Christina. So you don’t have to take my word for it. Because who knows what nefarious Illuminati agenda I have. There were plenty of times during the trial I thought she should have been fired but it wasn’t my place to say so. I also didn’t know how that would affect the trial itself, and I just didn’t have the courage to assert myself into the issue. But her cold and mean spirited display in the elevator, demanding money for appeal instead of comforting his mother and little brother, was intolerable. A couple of hours later I went to see Adnan in lockup. That was the first time I asked him any details about the case itself. Christina had failed to establish his movements that day so I asked him, “do you have any idea where you were after school?” And that’s the first time I heard Asia McClain’s name. I still have my crusty green notebook from 15 years ago in which I took notes about the trial and made this list of things that I needed to do right after I saw Adnan the day he was convicted. It got water damaged b/c for a while I had lots of his files in the trunk of my car. I went through the to-do list, and got that affidavit from Asia. When she told me Christina had never contacted her, I again thought she must have thrown the case on purpose. Once I got the affidavit, I wasn’t sure what to do with it though. Christina was still Adnan’s lawyer. 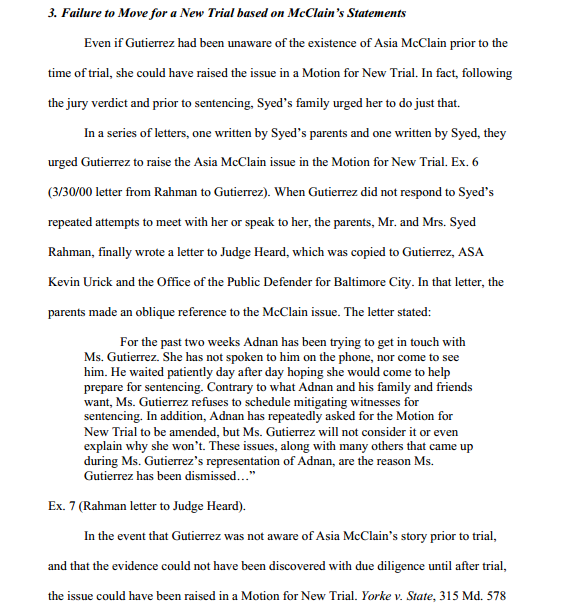 I had spoken to the family and Adnan about firing her (or at least not keeping her on for an appeal), but first we tried to get her to act on Asia’s affidavit. I drafted a couple of letters for Adnan’s parents. One to Christina, attaching Asia’s affidavit and requesting that she file a motion for a new trial. Then, when we received no response, I wrote a letter on their behalf directly to the judge. That was what you called desperation. 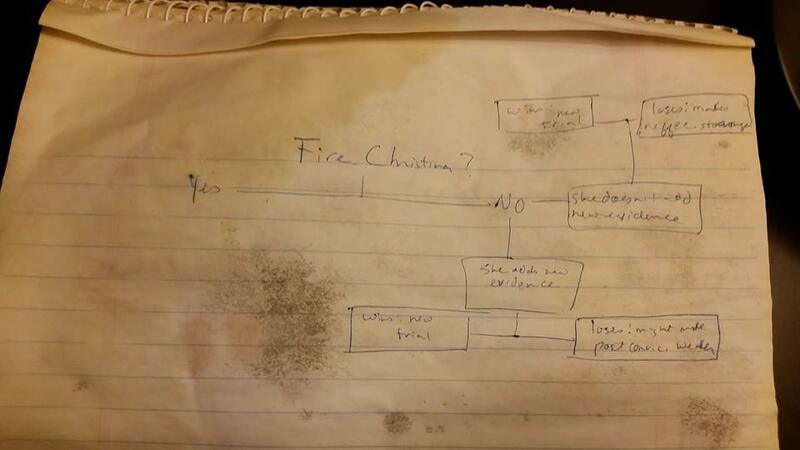 This is, honest to God, an actual flowchart I made to try and figure out if we should fire Christina. Also from the crusty old notebook. As you can see, I had already developed a keen legal mind. So that was the end of Christina’s representation of Adnan. Now I need to get to the gist of my displeasure with episode ten – Sarah’s “objectivity” on the issue of Christina. Actually no, that’s not the right word. Sarah wasn’t objective, she was “charitable”. Here is the problem with being charitable to Christina, and even the problem of Sarah deciding how to judge Christina. Sarah was not affected by Christina. The clients, the many many clients, who suffered because of Christina are the ones who have a right to judge her. So when the Whitmans say Christina lied to them (and she clearly did, especially with regard to the Supreme Court brief), it is utterly ridiculous to leap to Sarah’s conclusion that perhaps Christina’s failure to realize how sick she was had something to do with it. Those things aren’t even connected. And Sarah has no right to decide what really happened between the Whitmans and Christina. They were there, that is their story. Sarah is unduly impressed by Christina’s days of examination and futile soliloquies. Anyone with a basic understanding of the state’s case and access to prior witness statements could have done the same thing – it hardly required any preparation for her, an experienced litigator, to spend days cross examining state’s witnesses. 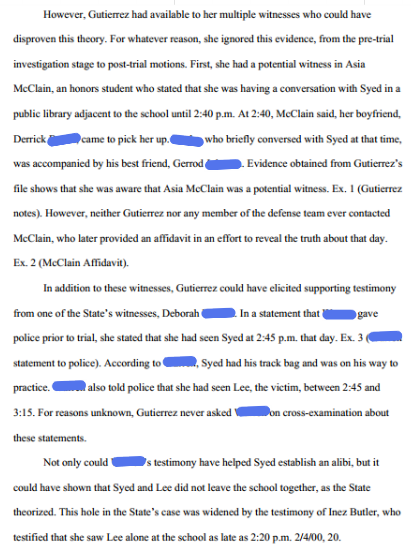 But it required major preparation to build and present an actual defense for Adnan, which she didn’t do. The way Adnan was characterized in this episode in terms of his feelings about Christina was also misleading. Adnan absolutely had total faith in her during the trial. She conveyed that sense of confidence and protectiveness to him. But that was then, or in his words, “in that situation”. After “that situation” Adnan knew full well how badly Christina had botched his case. The ineffective assistance of counsel claims raised in the case are HIS CLAIMS. Christina may have been a diligent, smart, brilliant attorney in her prime (though she also failed to convey a plea offer to a client all the way back in 1995). But when her health was deteriorating and she knew she wasn’t able to handle the work (to the extent of having to lie to clients about having actually done the work), instead of stepping out of practice, she kept taking people’s money. Christina didn’t make a few mistakes, she made enough terrible decisions to break the record for complaints filed against an attorney in the state of Maryland. Sarah uses the word compassionate at one point. But taking client money and not doing the work is not compassion, it’s corruption. Failing to prepare a defense in a case with literally no physical evidence tying the defendant to the crime is not compassion, it is utter incompetency. And I know incompetency when I see it. I’m an attorney. I’ve represented hundreds of clients. Twice in my career I’ve missed deadlines (but utilized corrective measures) and been sick over it. Sick because these clients entrust me with their lives – and yes, immigration affects a person’s life, their family’s life, and sometimes their extended family’s life, and their generations to come. Sick because I was paid to do a job (piddling amounts compared to Christina) and screwed up. And over the years I’ve seen dozens of attorneys literally destroy their clients cases through incompetence, negligence, or straight up fraud. I know incompetence when I see it. And when it happens, clients are entitled to their anger. Sarah has no dog in this fight. Its not her son, brother, loved one whose case and life was irretrievably damaged because of shoddy legal work. She has no right to judge Christina’s clients and their pain, and anger, and assessments. Until and unless she walked miles in these shoes, the years and years behind bars that clients have spent thanks to Christina, Sarah has no right to be charitable to her but not to the perspectives of the ones Christina hurt. *I have to add this – I have nothing but respect and even love for Sarah. I’ve said it many times before that those who love Adnan are so indebted to her and her team for their work. I’ve rejected the “white privilege” criticisms, stated that Sarah committed herself when no one else did, and have repeatedly recognized the tremendous work she’s done. Serial is a success because of Sarah’s work, dedication, and passion, and compassion. Adnan has another chance because of Sarah, even though she never set out to advocate for him. So please, don’t construe my indignation about this one issue as anything other than that – she deserves every journalism award that exists. And someone needs to write a ballad in her honor. Pronto.